They seem to come once a week or so. This one is a Facebook deal. $6 for $15 of grub, good through Jan 22, 2012. Today’s deal at LivingSocial. Pay $7 for $15 of Elevation goodness. Coupon will expire 12/4, although you can still redeem for $7 after that. So no reason not to buy! Another deal for Elevation, this time via Adealio via Facebook. $7 gets you $15. Good through 11/5/2011. One annoying condition listed: “Not to be combined with Meal Deal”. Huh? Why not? $10 gets you $20, good for six months. Get the deal here. The Northcross Mall Elevation Burger is now open! We are fans of the Elevation burger–they offer quality cheddar cheese, hormone-free etc etc beef, delicious fresh fries cooked in olive oil, and tons of free topping choices (including grilled onions…free!). Check it out. This is exciting news. I have eaten a different burger almost every week for over seven years, and the Nutty Brown Cafe burger remains one of my favorites. Popped in to Elevation for lunch today. Got the meal deal at $6.99 for cheeseburger, fries and a drink. I like the Elevation burger–it’s juicy, tastes fresh and comes with real cheddar. Fries are very good also. The burger is nothing amazing, but it’s a solid griddle burger. Imagine eating one of these with 10x the meat and cheese…see previous post for contest details. 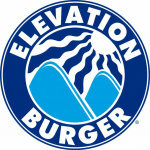 First to finish a 10-patty cheeseburger at Elevation, with fries, wins up to two free burgers per week for a year. That’s 104 free Elevation burgers. 12/3, 7pm at Elevation Burger, 9828 Great Hills Trail.